Weaving flowers into your daily life in unexpected ways lifts your spirits and beautifies your environment. Here we have used a jewelry stand and one bloomtube in each size: bitsy, baby, basic, and big to create a delightful micro garden experience. Bitsy holds two blooms from a stem of Larkspur also known as Delphinium. Baby holds a sprig of Veronica and a Scarlet Ranuculus. The basic holds a simple stem of Bells of Ireland. In the language of flowers it represents luck. 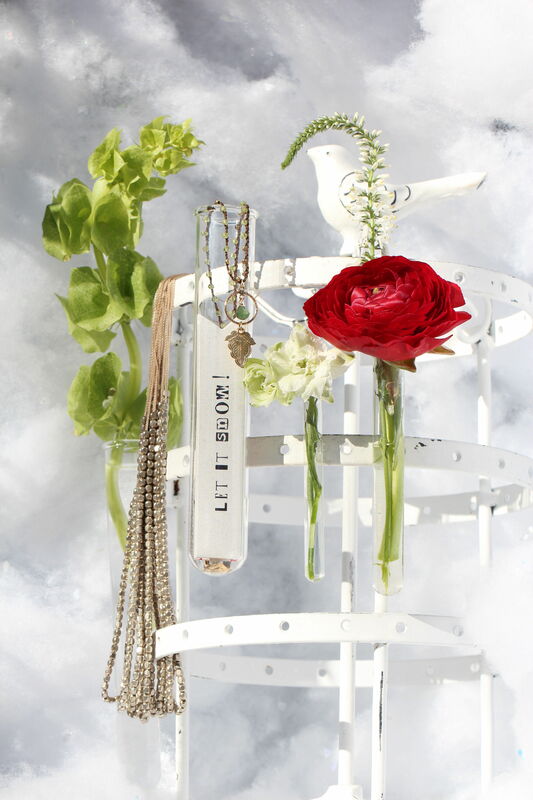 The Big bloomtube is very versatile and holds a holiday gift tag and a delicate necklace. Bloomtubes lets you incorporate flowers into unexpected places which keeps spaces fresh and exciting and also elevates your mood. Instinctually we are drawn to the uplifting effect of fresh flowers. Now scientific research to backs that up. Rutgers researchers found that participants in the study responded to flowers with what is known as the Duchenne smile—a heartfelt “true smile” involving the mouth, cheeks, and eyes.